Smokey Quartz AB 4x3mm Rondelle Drops (24) – Add 1 – Smokey Quartz AB 4x3mm Glass Crystal Rondelle to a ball pin. Make a 90° bend in ball pin above the bead. Using round nose pliers (or any pliers you have) hold the ball pin near the angle and bend it around the pliers to make a loop. Wrap down around ball pin creating as many coils as you can. Trim any extra. Repeat 23 times. Hematite 4mm Round Drops (4) – Add 1 - Hematite 4mm Round to a ball pin. Make a 90° bend in ball pin above the bead. Using round nose pliers (or any pliers you have) hold the ball pin near the angle and bend it around the pliers to make a loop. Wrap down around ball pin creating as many coils as you can. Trim any extra. Repeat 3 times. Black Onyx 4mm Semiprecious Round Drops (4) – Add 1 - Black Onyx 4mm Semiprecious Round to a ball pin. Make a 90° bend in ball pin above the bead. Using round nose pliers (or any pliers you have) hold the ball pin near the angle and bend it around the pliers to make a loop. Wrap down around ball pin creating as many coils as you can. Trim any extra. Repeat 3 times. 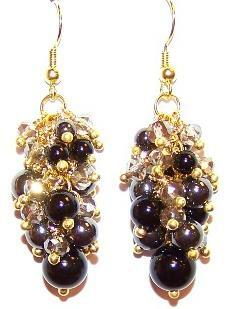 Hematite 6mm Round Drops (6) – Add 1 - Hematite 6mm Round to a ball pin. Make a 90° bend in ball pin above the bead. Using round nose pliers (or any pliers you have) hold the ball pin near the angle and bend it around the pliers to make a loop. Wrap down around ball pin creating as many coils as you can. Trim any extra. Repeat 5 times. Black Onyx 6mm Semiprecious Round Drops (4) – Add 1 - Black Onyx 6mm Semiprecious Round to a ball pin. Make a 90° bend in ball pin above the bead. Using round nose pliers (or any pliers you have) hold the ball pin near the angle and bend it around the pliers to make a loop. Wrap down around ball pin creating as many coils as you can. Trim any extra. Repeat 3 times. Black Onyx 8mm Semiprecious Round Drops (2) – Add 1 - Black Onyx 8mm Semiprecious Round to a ball pin. Make a 90° bend in ball pin above the bead. Using round nose pliers (or any pliers you have) hold the ball pin near the angle and bend it around the pliers to make a loop. Wrap down around ball pin creating as many coils as you can. Trim any extra. Repeat 1 time. 1. Open one 5mm jump ring, add 1 - Smokey Quartz AB 4x3mm Rondelle Drop, 2 - Hematite 4mm Round Drops, 1 - Smokey Quartz AB 4x3mm Rondelle Drop and add the loop of one dangle earring. Close the jump ring. 2. Open one 5mm jump ring, add 1 - Smokey Quartz AB 4x3mm Rondelle Drop, 2 - Black Onyx 4mm Semiprecious Round Drops, 1 - Smokey Quartz AB 4x3mm Rondelle Drop and the 5mm jump ring you added in Step 1 between the two Hematite 4mm Round Drops. Close the jump ring. 3. Open one 5mm jump ring, add 1 - Smokey Quartz AB 4x3mm Rondelle Drop, 2 - Hematite 6mm Round Drops, 1 - Smokey Quartz AB 4x3mm Rondelle Drop and the 5mm jump ring you added in Step 2 between the Black Onyx 4mm Semiprecious Round Drops. Close the jump ring. 4. Open one 5mm jump ring, add 1 - Smokey Quartz AB 4x3mm Rondelle Drop, 2 - Black Onyx 6mm Semiprecious Round Drops, 1 - Smokey Quartz AB 4x3mm Rondelle Drop and the 5mm jump ring you added in Step 3 between the Hematite 6mm Round Drops. Close the jump ring. 5. Open one 5mm jump ring, add 1 - Smokey Quartz AB 4x3mm Rondelle Drop, 2 - Hematite 6mm Round Drops, 1 - Smokey Quartz AB 4x3mm Rondelle Drop and the 5mm jump ring you added in Step 4 between the Black Onyx 6mm Semiprecious Round Drops. Close the jump ring. 6. Open one 5mm jump ring, add 1 - Smokey Quartz AB 4x3mm Rondelle Drop, 1 - Black Onyx 8mm Semiprecious Round Drops, 1 - Smokey Quartz AB 4x3mm Rondelle Drop and the 5mm jump ring you added in Step 5 between the Hematite 6mm Round Drops. Close the jump ring. 7. Repeat Steps 1 - 6 for the other earring.